Pony Thought of the Day: Is Bronydom Feminist? Apologies for the lack of a PTotD yesterday–I actually wrote one, but instead of queueing it I accidentally saved it as a draft. You can scroll down to see it–sorry about that! Anyway, I’ve got feminism on my brain. It shouldn’t be a surprise to anyone that Friendship Is Magic is a pretty feminist show. I have tended to assume that bronies are therefore also more inclined than the general populace to feminism, though with the caveat that, thanks to consistent and intentional misportrayal of feminism in mass media, there are a lot of people who believe everything feminists believe but recoil from the label. That said, I’ve based the assumption on a combination of the nature of the show, the fact that I haven’t personally witnessed or heard about any major incidents, and the general self-image of bronies as being an unusually open, welcoming, and non-judgmental fandom. But that’s not really a solid basis: it’s perfectly possible for someone to enjoy a feminist show while being a misogynist, if either the feminism or the misogyny is subtle enough; I’m a man, so any misogynistic behavior would not affect me directly and therefore I’d be less likely to notice it; and the self-image of a group is generally not a good predictor of its actual behavior. So, I’d like to ask the people reading, especially any women reading: Is your experience that bronies are more feminist/less sexist than the general populace? Do you feel that the brony community is a safe and welcoming place for women? If so, why do you think it’s so overwhelmingly male? Dun-dun dun dudun! Dun-dun dun dudun! April is Fanworks Month, where we take a break from the show for a few weeks and celebrate the creativity of the brony community by examining fanworks with the same seriousness and critical eye as regular episodes. This week is the abridged series Friendship Is Witchcraft by Sherclop Pones. I talked last week about the fun of watching new genres emerge, and Friendship Is Witchcraft is an example of another young new-media genre. There’s nothing new, of course, about parody dubs. They go back at least to 1966 and What’s Up Tiger Lily, and probably further. Abridged series, as introduced by LittleKuriboh with Yu-Gi-Oh the Abridged Series in 2006, are little more than a refinement on that idea, with the added element of cutting down (or occasionally adding to) the work being parodied. Nonetheless, it has been quite entertaining to watch imitators multiply and diversify. What abridged series do, in general, is a process of recontextualization. By taking the visuals of the original work and juxtaposing them with new audio, they create a dissonance that can be exploited for humor. This dissonance can occur as a result of seeing familiar characters behave in unfamiliar ways, or it can simply result from imperfections (intentional or otherwise) in the match between the new story and the visuals, or simply telling a funny story using those visuals. Most abridged series focus on the last two for humor, taking their cue from Yu-Gi-Oh the Abridged series, which does not require any knowledge of the original show to enjoy. Friendship Is Witchcraft, however, relies primarily on the dissonance of seeing beloved characters behave very differently, and as such can be read as a commentary on Friendship Is Magic as much as or more than a standalone work. When Twilight Sparkle takes her friends hostage and forces them to act out her slashfics, or Fluttershy heads an apocalyptic cult, the humor is in part the absurdity of the situation, but it’s primarily that the Friendship Is Magic characters would never do anything like that, even though the broad strokes elements of the characters are the same–that is, Twilight Sparkle is still a bossy nerd and Fluttershy is still soft-spoken and self-effacing. The characters, in other words, are not overwritten but recontextualized, just like the images of the show. The natural question, then, is what does this recontextualization accomplish? What does Friendship Is Witchcraft transform Friendship Is Magic into? Not unsurprisingly, the answer is pretty straightforward: a geeky cartoon comedy with meme depot and cult elements that would be right at home on Adult Swim. Take, for example, the series’ fifth and best episode, “Neigh, Soul Sister,” a parody of the second-season Friendship Is Magic episode “Sisterhooves Social.” Before it’s even possible to discuss it, we have to cover several elements of continuity from previous episodes: Pinkie Pie is an orphan who dabbled in illegal time-distorting magic in an attempt to bring back her parents. Robots who don’t know they’re robots live among the ponies and will be destroyed if discovered, and Sweetie Belle is one. Rarity and Applejack fought in a war together years prior, as a result of which Rarity is traumatized, Applejack considers her a coward and deserter, and Rarity considers Applejack a war criminal. Finally, as I mentioned previously, Fluttershy leads an apocalyptic cult that worships the Smooze, and Rarity is a member. The episode itself primarily follows Sweetie-Bot (as the fandom has named her) as the ponies around her repeatedly fail to recognize her true nature despite it being completely obvious. In a broad sense it follows the plot of “Sisterhooves Social,” in that Rarity and Sweetie-Bot fight, Sweetie-Bot latches onto Applejack as her “new sister,” and Rarity takes advantage of a festival celebrating sisterhood to demonstrate that she really does care about Sweetie-Bot. Alongside this, however, are two running subplots. 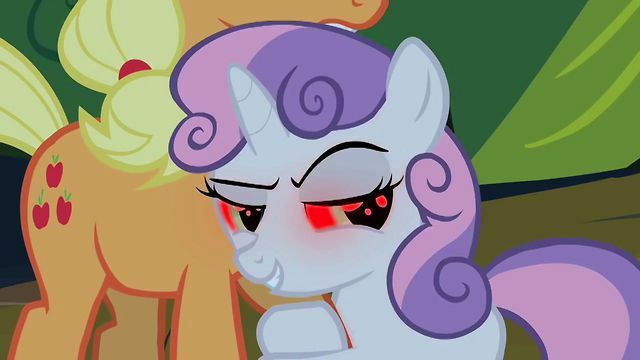 First, instead of being angry at Sweetie Belle for disrupting her fashion business, Rarity is angry because Sweetie Belle is messing up her preparations to help Fluttershy summon the Smooze during a solar eclipse to usher in the end of the world. Rarity then ditches the eclipse ritual to go to the sisterhood event, because she “wanted to save [Sweetie Belle’s] soul.” Meanwhile, Pinkie Pie’s time-distorting brew in the previous episode is apparently causing parents to return from the dead. It should be apparent by now that, despite using the actual episode’s visuals, this doesn’t have enough connection to the original show to even qualify as a parody of Friendship Is Magic. At the same time, it is clearly parodic in tone, so what is it parodying? The answer is actually in the second episode, “Read It and Sleep,” where Twilight Sparkle is depicted as an obsessive fanfic writer who ships Rarity and Applejack. Just as Friendship Is Magic depicts ponies as geeks, usually in a very positive light, Friendship Is Witchcraft parodies geeks, especially bronies. In that light, it becomes clear why it is so much more of a meme depot and cult show, and why it keeps tossing in “dark” and “edgy” elements like making Fluttershy a bunny-burning cult leader or Rarity a traumatized veteran. Friendship Is Witchcraft, when it boils down to it, is not a parody of Friendship Is Magic; it’s a parody of Friendship Is Magic fans and fanworks. Fluttershy’s apocalyptic cult has nothing to do with her depiction in the show, and everything to do with the fan-character Pinkamena (a psychotic, depressive, murderous version of Pinkie Pie) or the serial-killer Fluttershy in the .MOV series; it mocks these dark versions of the show by making Fluttershy evil without altering her social vulnerability or adorable shyness. Like a good cult show, the callback to the pun tells the viewers that there were clues, and if we had caught them and interpreted them properly, we’d know what was happening now–and by extension, what will happen in the future. It’s an open invitation to engage in what I referred to as the paranoid viewing style in my article on “Double Rainboom”; Friendship Is Witchcraft is asking us to treat it as a conspiracy, to scour it for clues and hints and try to predict the future. But of course it’s not playing fair; despite the ominous build-up Pinkie’s revival of the dead has no real pay-off in later episodes. It just causes her parents to come back as the Cake babies in the midst of an episode about something else entirely. Put another way, where “Double Rainboom” is a version of Friendship Is Magic where Rainbow Dash won the Running of the Leaves and turned the show into a meme depot, Friendship Is Witchcraft is a version where Rainbow Dash won the Running of the Leaves and turned it into a cult show. However, “Double Rainboom” doesn’t appear to understand that it’s doing something different from Friendship Is Magic, and tries to play it straight. Friendship Is Witchcraft, meanwhile, understands what a terrible idea a cult version of Friendship Is Magic would be, and plays it as ridiculous as possible. By being an utterly (but hilariously) terrible cult show, Friendship Is Witchcraft turns a parodic spotlight on the fandom itself. As I’ve mentioned, fandoms tend to be, collectively speaking, kind of terrible at figuring out why they like the target of their fandom. Pony fans seem at times to be absolutely determined to make it a cult show–already, barely two months after Season 3 ended, there are message board threads and YouTube videos speculating about what will happen in Season 4, as if the answer to that question can be found in the events of previous episodes. Friendship Is Magic simply doesn’t work that way; it’s not a show with complex overarching plots, either on a seasonal level or across seasons. It doesn’t seed clues to future episodes in past ones. Simply put, there are no rewards for taking the paranoid approach here–but because that approach has been the norm for geeky television since Buffy (which started, I am horrified to realize, when the average brony was five years old) many of the fans don’t know how to watch any other way. So my advice would be to relax, kick back, and watch some Friendship Is Witchcraft. Laughing at ourselves, and the quirks and excesses of our community, is always healthy. We could probably use some more of it. Next week: Fanworks month is over! We’re back to the show. And what rough beast, its hour come round at last, slouches toward Canterlot to be born? When Pinkie Pie asks for a cup of flour, and Applejack misinterprets that as “cup of sour” and goes for lemons, in the Japanese it relies on the similarity between Japanese words for “flour” and “yellow,” so she adds the lemons on the grounds that they’re yellow. Fits the visuals, and works perfectly in the context, keeping the spirit of the pun intact without losing the sense of the scene. Well played! Later, the “baked goods”/”baked bads” pun is replaced with a pun based on the similarities between the Japanese words keeki (cake) and keiki (condition), to have Pinkie say something like “We ate the cake, and it gave us this condition.” Again, keeps the flow of the scene and the fact that there’s a pun there, but puts in something that actually works in Japanese. I continue to be really impressed with the quality of the Japanese dub. Here’s another new BESM attribute for my pony game. The ability to use weather to attack hasn’t shown up much in the show, but seems logical, is crucial to Turnabout Storm, and made possible one of Rainbow Dash’s best moments in the big crossover game I ran at Anime USA (specifically, it’s how she beat LadyDevimon). So I tossed it in. Weather Control (3/level): You have the ability to physically manipulate clouds and winds. Unlike Environmental Control, which is supernatural or technological, this requires you to physically move air and clouds, and therefore requires your full attention. However, again unlike Environmental Control, it can be used to attack with wind, rain, snow, or lightning. (Treat the attack as a Weapon Attack of one level lower than the pony’s level of Weather Control). Level 1: You can stand and walk on clouds as if they are ground. Level 2: You can move individual clouds to create precipitation, lightning, or sunshine over a small area (5-meter radius). You can only create temperature-appropriate effects (that is, you cannot make it snow on a hot day). You can also create gentle breezes. Level 3: You can move multiple clouds in a round to control the weather in a larger area (30-meter radius). You can still only create temperature-appropriate effects, and create stronger gusts of wind. Level 4: You can control weather in a 100-meter radius, create temperature inappropriate effects (such as snow in summer), and create gale-force winds. 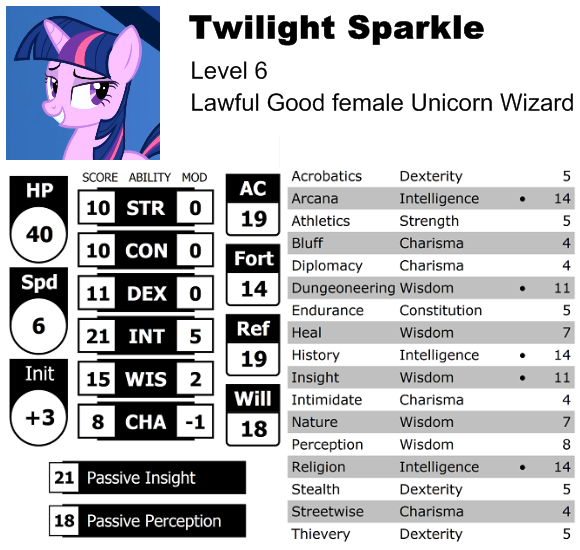 Level 5: You can control weather in a 200-meter radius, including temperature-inappropriate effects, and create winds strong enough to knock ponies over (Body check to prevent). Level 6: You can clear the sky over an entire town in ten seconds flat, or otherwise control the weather for a town-sized area, and create tornado-strength winds. Still looking at my Lyra fig, and thinking about how little it looks like an actual Friendship Is Magic character from the front, it occurs to me: Are the characters even physically possible? I don’t mean as living things or anything like that; I mean as three-dimensional shapes. I’m not an artist, and I’m kind of awful at spatial reasoning, but it seems to me like the face-on views in the show are not compatible with the profile views–there’s no possible head shape for a toy that would accurately capture both angles. I’m sitting staring at my Lyra, trying to figure out today’s Pony Thought of the Day, and so I find myself thinking about why the toy is where it is. Lyra lives on my desk, between my monitors, and it is under her watchful, judgmental gaze that I do my work. Having her watch me makes me less distractable, or at least I think it does, and that amounts to the same thing in the end. In this sense she functions very much like one use of an idol or household god. I think sometimes part of the price we pay for having monotheistic religions dominate in our culture is that we’ve lost this notion of making your own watchers, rituals, and superstitions, but play can sometimes restore this loss. Which isn’t to say that I think Lyra is somehow real or that some sort of divine energy inhabits the little lump of green plastic on my desk or anything like that. It’s entirely something I’ve constructed; Lyra’s “watchful gaze” exists only in my imagination. Her effect on my productivity is pure placebo.